At the end of October 1945, having found suitable rented accommodation in Canada at Sainte-Marguerite-du-Lac-Masson some fifty miles north of Montréal, once more Simenon was able to establish his writing schedule. During 1946 and 1947 he wrote 10 novels (3 of them involving Maigret) and 10 of the longer short stories (with Maigret featuring in 4 of them), but they were not all written at the same locations. Having lived for a while at Bradenton Beach in Florida, Simenon, his son Marc and Denyse Ouimet travelled west by car through some of the Southern States until they reached Tucson in Arizona on the 9th of September 1947. The proprietor of the hotel where they were staying informed them that there was a villa for rent in Tucson in West Franklin Street owned by a Mrs. Kingan, the widow of a lawyer. This villa was large enough to accommodate not only Simenon, Marc and Denyse, but also the author’s wife Tigy, and Boule, who finally had obtained her American visa. Some years before when the lawyer who owned the villa retired, he took up painting, using a separate building in the garden as his studio. Now, this studio suited Simenon very well as his office where he could shut himself away in order to write. It was here that he wrote four novels  La Jument Perdue (The Lost Mare  not translated), Les Vacances de Maigret (A Summer Holiday / No Vacation for Maigret / Maigret on Holiday), Maigret et son Mort (Maigret’s Special Murder / Maigret’s Dead Man) and La Neige était Sale (The Stain on the Snow / The Snow was Black), this last being one of Simenon’s best and most powerful novels. Simenon finished writing Les Vacances de Maigret on the 20th of November 1947. Less than a month later on the 17th of December he completed another Maigret novel entitled Maigret et son Mort which is very different from the previous one. Maigret et son Mort is set in Paris, with Maigret once more very much in charge of his department on the Quai des Orfèvres. At the centre of this novel, the author uses a theme, or rather a variation on a theme that he has used twice before. This theme concerns a gang associated with a series of vicious attacks on the occupants of isolated farms in Northern France culminating in their murder The reason for the attacks is to steal as much money as possible from the farms and the murders are carried out so as to eliminate any witnesses to the gang’s identity. Simenon first used the idea of the gang of Polish origin in the Maigret short story Stan-le-Tueur (Stan the Killer) written during Simenon’s fifth visit in 1938 to the Island of Porquerolles off the coast of the French Riviera. Three or four of the gang are living in the Hôtel Beauséjour on the corner of the Rue de Birague and the Rue Saint-Antoine in the Marais area of Paris. Maigret has organised a lengthy surveillance of the hotel with, among others, Lucas and Janvier. This short story, in three chapters, concentrates on Maigret, with the help of his team, attempting to discover as much information about the gang in order to bring them to justice. In the non-Maigret novel L’Outlaw (The Outlaw) written at Nieul-sur-mer (Vendée) and completed on the 7th of February 1939, Simenon also makes use of the theme of a Polish gang thought to be responsible for murderous attacks on isolated farms in Northern France. In the short story Stan the Killer events are seen mainly through Maigret’s eyes, but in the novel The Outlaw the storyline revolves very much around the principal character Stan  Stanislas Sadlak, and from the beginning Simenon builds up a character study of Sadlak with most things seen from his point of view. Sadlak, who is Polish, originally from Wilno (now Vilnius), has wandered from place to place, but is now in Paris accompanied by his Hungarian girlfriend Nouchi Kersten. Without money or a place to live, both are desperate to find ways of financing themselves. Simenon divides the novel into two parts with the first part devoted to the thoughts and actions of Sadlak, Nouchi having wandered off. Sadlak has known Frida Stavitskaïa, the leader of the gang, for some time as she also originates from Wilno. He meets up with her, but is coerced into buying some items of equipment for the gang. Wanting to escape from their hold over him, he approaches the police in an attempt to impart information about them, providing the police pay him a certain amount of money. This way the gang will be arrested and in custody, he will be free of them, as well as having some money on which to live, but the police are not interested in his proposition. In the second part, Nouchi Kersten is being looked after in their home by a Doctor Helmut Storm and his wife Hilda, who were friends of her father. Nouchi manages to smuggle Sadlak into the doctor’s large residence. Sadlak is at the end of his tether, fearful of the gang, who are being sought individually by the police. Simenon has used a name from his childhood in Liège, that of Frida Stavitskaïa, who in this novel is a young Polish woman, leader of the gang and being sought by the police for criminal activities. In reality, in his boyhood, Frida Stavitskaïa was a medical student studying at the University of Liège from 1910 to 1913 and lodging with the Simenon household at 53 Rue de la Loi in the district of Outremeuse in Liège. She originated from a suburb of Odessa in Russia. Also some of the police involved have familiar names such as le Commissaire (Superintendent) Lognon and Inspectors Janvier and Lucas. But this in not the case that some might call a “semi-Maigret”, as it is not an investigation and the police are mainly carrying out surveillance, following and arresting suspects, with the author keeping any characterisation of the police to a minimum. A section of the city of Paris showing part of the Marais area, including the Rue Saint-Antoine, the Rue de Birague (off the Place des Vosges), the Rue des Francs-Bourgeois, the Rue Vieille-du-Temple, the Rue des Rosiers and the Rue du Roi-de-Sicile, some of the locations in the short story Stan the Killer and in the novels The Outlaw and Maigret’s Special Murder. 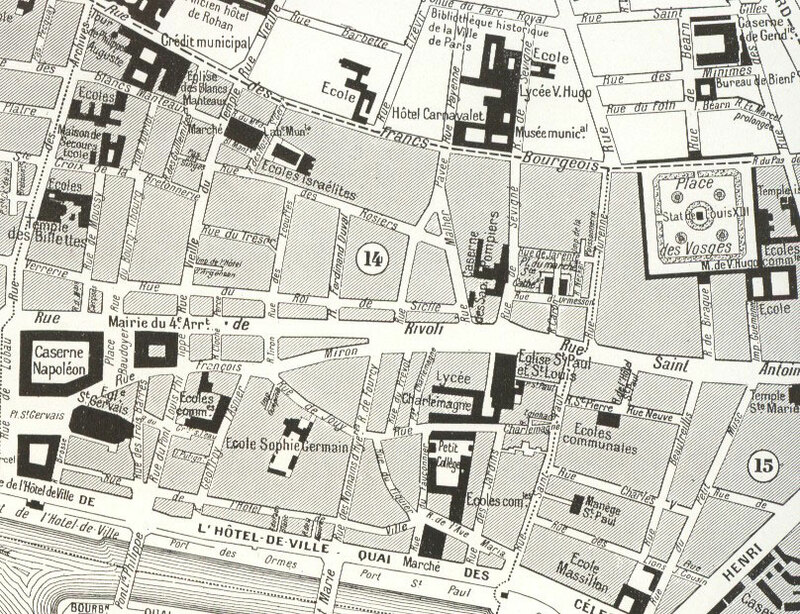 This Map is dated 1925 when Simenon was living in an apartment at 21 Place des Vosges. (Albert Dauzat et Fernand Bournon, Paris et ses Environs, Librairie Larousse, Paris, 1925). As in the novel L’Outlaw, the novel Maigret et son Mort is concerned with one individual, later identified as Albert Rochain, and his connection with the gang. (For this Maigret novel Simenon makes a change of nationality as the gang are now of Czech and Slovak origin rather than Polish). Although at first unaware of his name, Maigret first encounters Albert Rochain when the latter makes a series of hectic telephone calls to him from a variety of locations in Paris. After a lull in activities, a man’s body is discovered in a corner of the Place de la Concorde in the centre of Paris. Maigret is convinced that it is the same man who made all the telephone calls to him and from then on Maigret empathises with “his dead man” determined to discover the truth that led to his demise. Simenon constructs this novel with a variety of pace, having interludes of quiet dispersed with periods of hectic activity. He uses some of the quiet interludes in which to establish elements of sly humour, as when Maigret at home, nursing a cold, first explains to the Examining Magistrate, Coméliau, over the telephone, the progress of the investigations. Then later, again at home catching up on his sleep, during which he talks to his wife about certain aspects of the case and asks her to make a telephone call. At other times Simenon reminisces briefly about Maigret’s previous involvement near Charenton (the novel Maigret Returns) as well as Lucas’ part in the investigation of "Stan the Killer". It is at Charenton, just beyond the twelfth arrondissement, where Maigret, with the help of one of his Inspectors, establishes, for a time, a base in a small bistro. From there Lucas and Maigret are led to a narrow street in the Marais area where they discover evidence related to the gang. The investigation spreads to various parts of Paris and, on one occasion, to a location south of the city, which helps him finally to piece together the truth. This is one of the most satisfying of the Maigret novels as it has many aspects of his approach to an investigation. The only translation of this novel is by Jean Stewart who follows Simenon’s text closely. There is a curious error with the translation of the French Inspecteur, which becomes, in English, Sergeant in all instances. Jean Stewart translated 52 works by Simenon (4 Maigret novels and 25 Maigret short stories, as well as 23 other works) and I am not aware that this error occurs elsewhere in the translations by Jean Stewart other than in this novel. I wonder if the error in this one novel is not the mistake of the translator, but of an English editor, sub-editor or proof-reader who may have altered the rank in the translation. A small but interesting point. "Maigret et son mort" est un de mes romans préférés dans la série des "Maigret", parce qu'il est un des plus typiques en ce qui concerne la façon qu'a le commissaire de "travailler" avec son intuition. Et il illustre aussi la relation que le commissaire peut tisser avec une victime dont il s'occupe. "Maigret et son mort" offre, sur ce plan-là, bien des similitudes avec "Maigret et la jeune morte." On pourra relever ainsi, lorsque Maigret se rend sur les lieux où l'on a découvert le cadavre d'Albert Rochain: "[…] il s'approcha lentement de la forme étendue […] et se courba, lentement toujours – comme il l'aurait fait pour un parent ou un ami" (début du chapitre 2) , ou encore: "il suivait son mort", toujours dans le chapitre 2, quand Maigret se rend aux Caves du Beaujolais, d'où la victime lui avait téléphoné pour la première fois. Et dans "Maigret et la jeune morte", le commissaire a la même façon de "suivre" Louise Laboine, pour chercher à la comprendre, à la "connaître", comme il le dit lui-même au début du chapitre 9. Si Maigret découvre finalement comment et pourquoi Louise a été tuée, c'est parce qu'il s'est "mis dans la peau" de la jeune fille, qu'il s'est "préoccupé de sa mentalité" (voir le chapitre 9). De même, Maigret se rend dans les cafés d'où Albert Rochain lui a téléphoné, puis, lorsqu'il a découvert son propre café (Au Petit Albert) il s'y installe ("le commissaire […] paraissait vraiment prendre possession d'un nouveau domicile. En moins d'une demi-heure, il y était comme chez lui"), y boit, comme Albert, une Suze, y passe la nuit ("Il essayait la maison, comme on essaye un vêtement neuf"). C'est en cherchant à se mettre à la place de "son mort", en agissant comme lui, en faisant en quelque sorte les mêmes gestes que lui, que Maigret finit par comprendre comment celui-ci est tombé sur la piste de la bande des Tchèques et pourquoi ceux-ci l'ont tué. C'est de la même façon que Maigret cherche à comprendre Jules Lapie dans "Félicie est là" quand il essaye le chapeau de paille de Jambe-de-bois, et, comme le dit le directeur de la PJ "s'installe dans une enquête comme dans des pantoufles" ("Félicie est là", début du chapitre 2), ou, dans "Maigret et l'homme du banc", au chapitre 5, "Il pensait tellement à Louis qu'il finissait par se comporter comme celui-ci l'aurait fait, par prendre ses expressions de physionomie.". Et l'on pourrait trouver de nombreux autres exemples d'"identification" du commissaire, soit à la victime, soit parfois même au meurtrier, toujours dans un but de comprendre. On remarquera, en outre, comme un autre point intéressant, à propos de la "psychologie" de Maigret, son attachement au Boulevard Richard-Lenoir: dans le chapitre 3, Simenon nous raconte comment des collègues, des amis, ont proposé d'autres appartements à Maigret, et comment celui-ci a toujours refusé de déménager, parce que "ce n'étaient pas tellement les déménagements qui l'effrayaient, mais le fait de changer d'horizon. L'idée […] de ne plus faire le même chemin, chaque matin, le plus souvent à pied…". Maigret est loin, ici, d'un Simenon toujours en mouvement, traversant les pays et les continents et s'installant dans un nouveau logis – qu'il croit être définitif mais en fait toujours provisoire ("chaque fois que je change le cadre de ma vie, je ressens une exaltation et je me gonfle d'espoir." in Des traces de pas). Un autre aspect significatif dans Maigret et son mort, c'est la manière dont le commissaire se sert des indices matériels. On pourra lire, à ce propos, la scène du chapitre 2 où Maigret utilise le mannequin du laboratoire de l'Identité judiciaire. Il faut voir comment le commissaire découvre que la victime ne portait pas son imperméable au moment du meurtre, malgré que ce vêtement porte une déchirure de couteau. Alors qu'un Sherlock Holmes, ou un Hercule Poirot, par exemple, nous gratifieraient d'une longue explication sur la forme de la déchirure, sur la position possible du couteau, etc., Maigret se contente de faire des "essais" avec le mannequin, le manipulant dans tous les sens, jusqu'à ce que la solution lui apparaisse d'elle-même. Simenon nous décrit les gestes du commissaire, son travail dans le concret, mais il ne nous décrit pas le cheminement de sa pensée, seulement son aboutissement "Voilà! conclut Maigret, comme s'il venait de résoudre une équation difficile." On pourra comparer, à cet effet, le même genre de travail qu'effectue le commissaire sur les habits d'Emile Gallet (M.Gallet, décédé, chapitre 5). Un autre élément à retenir est la "tactique" qu'emploie Maigret quand il piétine dans une enquête, à savoir la "grippe". Dans Maigret et son mort, au chapitre 3: "Cela lui arrivait de temps en temps, comme ça, quand une enquête n'avançait pas à son gré, de se mettre au lit ou de garder la chambre." J'ai retrouvé deux autres endroits où le commissaire utilise la grippe pour progresser dans le cheminement de son enquête: dans La première enquête de Maigret, chapitre 9: "Il s'enfonçait dans son lit moite, dans une bonne odeur de sueur. C'était une façon de se replier sur lui-même. Il ne savait pas encore que cela deviendrait une manie, qu'il recourrait souvent à ce procédé dans ses moments de découragement ou d'embarras." Et, bien sûr, dans la nouvelle Le témoignage de l'enfant de chur: "Il était tout seul, tout chaud, tout mouillé, au plus profond de son lit […]" "Et ce serait une très jolie chose, une enquête pas banale, menée du fond de son lit." Il me semble qu'il y a d'autres romans où Maigret se sert de sa grippe pour son enquête, mais je n'ai pas retrouvé lesquels en faisant une rapide recherche. Y aurait-il un internaute maigretphile qui aurait une piste à nous indiquer? Une dernière chose à noter: la visite de Mme Aubain-Vasconcelos, au début du chapitre 1, qui fait partie de cette galerie de personnages que Simenon ne fait qu'esquisser, et qu'il place volontiers au début d'un roman, et dont on pourrait croire qu'ils sont le point de départ de l'intrigue, mais qui vont en réalité ne "faire que passer" dans l'histoire. On pourrait mentionner, dans ce défilé, la dame qui vient lui parler des lettres de menace que sa voisine lui adresse (Le revolver de Maigret), ou la vieille mercière folle, Clémentine Pholien (Maigret et le client du samedi). En voyez-vous d'autres ? [translation] Maigret et son mort is one of my favorite novels in the Maigret series, because it is one of most typical with regard to the way the commissioner "works" with his intuition, and it also illustrates the relationship that he can form with a victim he is involved with. 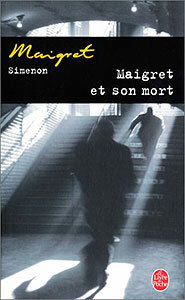 Maigret et son mort resembles, in that sense, Maigret et la jeune morte [Inspector Maigret and the Dead Girl]. 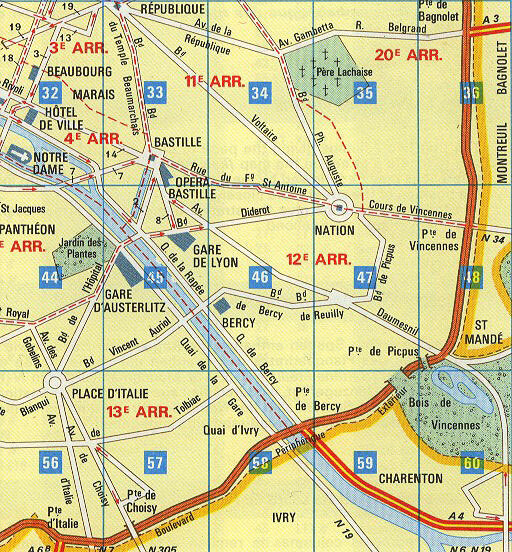 So we find, at the beginning of Chapter 2, when Maigret goes to the scene where Albert Rochain's body was found, "… he slowly approached the stretched-out shape … and bent over, still slowly – as he would have for a parent or a friend..." or, in the same chapter, "he followed his dead man," when Maigret goes to the Caves du Beaujolais, from which the victim had phoned him for the first time. In the same way, in Maigret et la jeune morte, the commissioner "follows" Louise Laboine, to try to understand her, to "know" her, as he says himself at the beginning of Chapter 9. So when Maigret finally discovers how and why Louise had been killed, it is because he had "gotten into the girl's skin", because of his concern with her mentality" (Chapter 9). In the same manner, Maigret visits the cafés from which Albert Rochain had phoned him, and then, when he discovers Albert's own café, Au Petit Albert, he sets himself up there... ("the commissioner … really seemed to be moving into a new domicile. In less than half an hour, it was like he was at home"), drinks a Suze there, like Albert, passes the night there ("He tried on the house as one tries on a new garment"). It is while trying to get into "his dead man," while acting like him, doing things more or less the same way he would, that Maigret ends up understanding how Albert had wound up on the track of the Czech gang and why they had killed him. It is like how Maigret tries to understand Jules Lapie in Félicie est là [Maigret and the Toy Village] when he tries on Peg Leg's straw hat, and, as the director of the PJ says, "gets settled into an investigation like into a pair of slippers" (beginning of Chapter 2), or, in Maigret et l'homme du banc [Maigret and the Man on the Bench], in Chapter 5, "He thought so much about him that he ended up behaving as Louis would have, even taking on his facial expressions." And we can find many other examples of the commissioner's "identification", either with the victim, or sometimes with the murderer, with the goal always to understand. We notice, besides, as another interesting point with regard to the "psychology" of Maigret, his attachment to the Boulevard Richard-Lenoir: In Chapter 3, Simenon tells us how colleagues and friends proposed other apartments to Maigret, and how he always refused to move, because "it was not so much the moves that troubled him, but the fact of changing the scene. The idea … of no longer taking the same path every morning, usually on foot…" Maigret here is far from a Simenon always in motion, crossing countries and continents and getting settled into new lodgings – that he always believed to be permanent, but which somehow always wound up as temporary. ("Every time I change the setting of my life, I feel an exaltation and I'm filled with hope." Des traces de pas [Dictée 1975]). Another significant aspect of Maigret et son mort is the manner in which the commissioner uses material evidence. We can consider, in this regard, the scene in Chapter 2 where Maigret uses the laboratory mannequin at Judicial Identity. We have to see how the commissioner discovers that the victim wasn't wearing his raincoat at the time of the murder, although it shows a cut from a knife. Whereas a Sherlock Holmes or a Hercules Poirot, for example, might present us with a long explanation of the shape of the cut, the possible position of the knife, Maigret is content to make "tests" with the mannequin, manipulating it in all directions, until the solution appears to him by itself. Simenon describes concretely the commissioner's gestures, his actions, but he doesn't describe the progress of his thoughts, only the outcome. "Aha! concludes Maigret, as if he had just solved a difficult equation." We could consider in the same way the operation that he does on the clothing of Emile Gallet in M.Gallet, décédé [Maigret Stonewalled] (Chapter 5). Another memorable element is the "tactic" that Maigret uses when he is stuck in an investigation, the "flu". In Maigret et son mort, Chapter 3: " It happened to him from time to time like that, when an investigation didn't advance to his liking, to get in bed or keep to his room." I found two other places where the commissioner uses a flu to further the progress of his investigation: In La première enquête de Maigret [Maigret's First Case], Chapter 9, "He snuggled into his damp, sweaty bed. It was a way to withdraw into himself. He didn't know yet that it would become a habit, that he would often resort to this process in his moments of discouragement or embarrassment". And, of course, in the story Le témoignage de l'enfant de chur [The Evidence of the Altar-Boy]: "He was all alone, all hot, all wet, deep in his bed… And it would be quite an achievement, a difficult investigation solved from his sick-bed ." It seems to me that there are other novels where Maigret uses his flu for an investigation, but I didn't find any more while doing a quick search. Is there an Internaut Maigretphile who can lead us on the track to this? A final thing to note: the visit of Mrs. Aubain-Vasconcelos, at the beginning of Chapter 1, that is part of the character gallery that Simenon only sketches, and that he places freely in a novel at the beginning  someone we could believe to be the starting point of the intrigue, but is actually "just passing through" the story. One could mention, in this parade, the lady who comes to tell him of threatening letters from her neighbor in Le revolver de Maigret [Maigret's Revolver], or the mad old haberdasher, Clementine Pholien in Maigret et le client du Samedi [Maigret and the Saturday Caller]. Can you think of any others?